While most of us won’t have ever given a serious thought to repurposing useless household stuff, folks at Curious Provisions make it go as audible as it probably could. With their aim to upgrade your music listening experience, they announce the arrival of the Thumper range of boomboxes, which owe their origin to some traditional, vintage, limited-edition, upcycled suitcases. 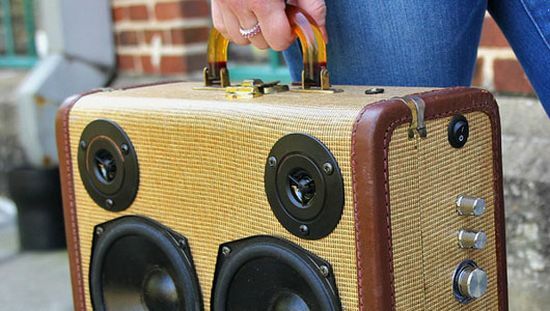 Despite the fact that the speakers are made from high-quality vintage suitcases, they are cool enough to carry around to work, school or your parties. The speakers can connect to your MP3 players, turntables and laptops via auxiliary cable (included). Further, you can adjust the volume, bass or treble through buttons on sides. The one-of-a-kind Thumpers are much better than the run-of-the-mill speakers you hate to tote around. Definitely more attractive than the tawdry portable speakers, the Thumpers are available in various shapes and sizes to soothe your senses. Dilophosaurus, Jenner and Lady Bug: all of them are worth buying for sure.